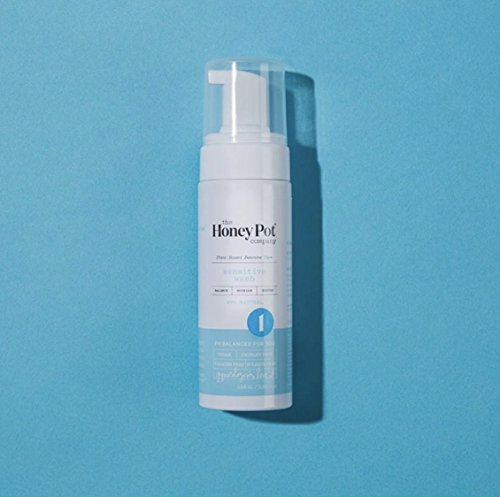 Product Details The Honey Pot's sensitive feminine wash is the first step in their three-step system. Formulated with plant-based goodness, but just a lighter concentration, this sensitive feminine wash is made for girls and women who are easily irritated whenever they introduce new products into their routine. This intimate cleanser for sensitive skin is only to be used externally, not for douching. Banish odor causing bacteria with every use Balance pH levels with natural plant essences Boost moisture levels and avoid the dreaded dry feeling Aqua, Potassium Cocoate, Leuconostoc/Radish Root Ferment Filtrate, Acetic Acid (Apple Cider Vinegar), Lavandula Angustifolia (Lavender) Flower Water, Rosa Damascena (Rose) Flower Water, Helianthus Annuus (Sunflower) Seed Oil, Althaea Officinalis (Marshmallow) Root Extract, Asparagus Racemosus (Shatavari) Root Extract, Citrus Grandis (Grapefruit) Seed Extract, Propanediol, Allium Sativum (Garlic) Bulb Extract, Lavandula Angustifolia (Lavender) Oil, Hydrogen Peroxide.